This article is about the personification of the world-ocean in Greek myth. For other uses, see Oceanus (disambiguation). "Okeanos" redirects here. For the NOAA research vessel, see NOAAS Okeanos Explorer. Oceanus (/oʊˈsiːənəs/; Greek: Ὠκεανός Ōkeanós, pronounced [ɔːkeanós]), also known as Ogenus (Ὤγενος Ōgenos or Ὠγηνός Ōgēnos) or Ogen (Ὠγήν Ōgēn), was a divine figure in classical antiquity, believed by the ancient Greeks and Romans to be the divine personification of the sea, an enormous river encircling the world. R. S. P. Beekes has suggested a Pre-Greek proto-form *-kay-an-. In contrast, Michael Janda has reminded the scientific community of an earlier comparison of the Vedic dragon Vṛtra's attribute āśáyāna- "lying on [the waters]" and Greek Ὠκεανός (Ōkeanós), which he sees as phonetical equivalents of each other, both stemming from a Proto-Indo-European (PIE) root *ō-kei-ṃ[h1]no- "lying on", related to Greek κεῖσθαι (keîsthai "to lie"). Janda furthermore points to early depictions of Okeanos with a snake's body, which seem to confirm the mythological parallel with the Vedic dragon Vṛtra. Another parallel naming can be found in Greek ποταμός (potamós "broad body of water") and Old English fæðm "embrace, envelopment, fathom" which is notably attested in the Old English poem Helena (v. 765) as dracan fæðme "embrace of the dragon" and is furthermore related (via Germanic *faþma "spreading, embrace") to Old Norse Faðmir or Fáfnir the well-known name of a dragon in the 13th century Völsunga saga; all three words derive from PIE *poth2mos "spreading, expansion" and thus bind together the Greek word for a "broad river, stream" with the Germanic expressions connected to the dragon's "embrace". around the uttermost rim of the strongly-wrought shield. In Greek mythology, this ocean-stream was personified as a Titan, the eldest son of Uranus and Gaia. Oceanus' consort is his sister Tethys, and from their union came the ocean nymphs, also referred to as the three-thousand Oceanids, and all the rivers of the world, fountains, and lakes. In most variations of the war between the Titans and the Olympians, or Titanomachy, Oceanus, along with Prometheus and Themis, did not take the side of his fellow Titans against the Olympians, but instead withdrew from the conflict. In most variations of this myth, Oceanus also refused to side with Cronus in the latter's revolt against their father, Uranus. He is, it appears, some sort of an outlaw to the society of Gods, as he also does not—and unlike all the other river gods, his sons—take part in the convention of gods on Mount Olympus. Besides, Oceanus appears as a representative of the archaic world that Heracles constantly threatened and bested. As such, the Suda identifies Oceanus and Tethys as the parents of the two Kerkopes, whom Heracles also bested. Heracles forced Helios to lend him his golden bowl, in order to cross the wide expanse of the Ocean on his trip to the Hesperides. When Oceanus tossed the bowl about, Heracles threatened him and stilled his waves. 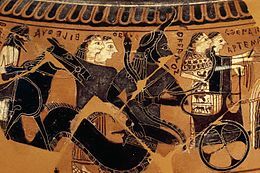 The journey of Heracles in the sun-bowl upon Oceanus became a favored theme among painters of Attic pottery. 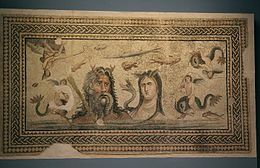 In Hellenistic and Roman mosaics, this Titan was often depicted as having the upper body of a muscular man with a long beard and horns (often represented as the claws of a crab) and the lower body of a serpent (cfr. Typhon). On a fragmentary archaic vessel of circa 580 BC (British Museum 1971.11–1.1), among the gods arriving at the wedding of Peleus and the sea-nymph Thetis, is a fish-tailed Oceanus, with a fish in one hand and a serpent in the other, gifts of bounty and prophecy. In Roman mosaics, such as that from Bardo, he might carry a steering-oar and cradle a ship. Oceanus appears in Hellenic cosmography as well as myth. Both Homer and Hesiod refer to Okeanós Potamós, the "Ocean Stream". When Odysseus and Nestor walk together along the shore of the sounding sea they address their prayers "to the great Sea-god who girdles the world". Cartographers continued to represent the encircling equatorial stream much as it had appeared on Achilles' shield. As for the writer who attributes the phenomenon to the ocean, his account is involved in such obscurity that it is impossible to disprove it by argument. For my part I know of no river called Ocean, and I think that Homer, or one of the earlier poets, invented the name, and introduced it into his poetry. Some scholars[who?] 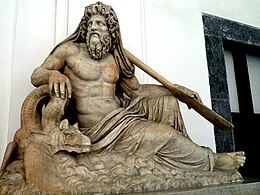 believe that Oceanus originally represented all bodies of salt water, including the Mediterranean Sea and the Atlantic Ocean, the two largest bodies known to the ancient Greeks. 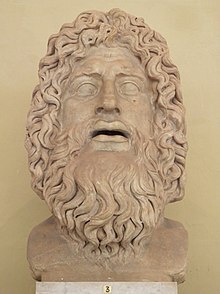 However, as geography became more accurate, Oceanus came to represent the stranger, more unknown waters of the Atlantic Ocean (also called the "Ocean Sea"), while the newcomer of a later generation, Poseidon, ruled over the Mediterranean Sea. Late attestations for an equation with the Black Sea abound, the cause being – as it appears – Odysseus' travel to the Cimmerians whose fatherland, lying beyond the Oceanus, is described as a country divested from sunlight. In the fourth century BC, Hecataeus of Abdera writes that the Oceanus of the Hyperboreans is neither the Arctic nor Western Ocean, but the sea located to the north of the ancient Greek world, namely the Black Sea, called "the most admirable of all seas" by Herodotus, labelled the "immense sea" by Pomponius Mela and by Dionysius Periegetes, and which is named Mare majus on medieval geographic maps. Apollonius of Rhodes, similarly, calls the lower Danube the Kéras Okeanoío ("Gulf" or "Horn of Oceanus"). Hecataeus of Abdera also refers to a holy island, sacred to the Pelasgian (and later, Greek) Apollo, situated in the easternmost part of the Okeanós Potamós, and called in different times Leuke or Leukos, Alba, Fidonisi or Isle of Snakes. It was on Leuke, in one version of his legend, that the hero Achilles, in a hilly tumulus, was buried (which is erroneously connected to the modern town of Kiliya, at the Danube delta). Accion ("ocean"), in the fourth century AD Gaulish Latin of Avienus' Ora maritima, was applied to great lakes. ^ Ὠκεανός. Liddell, Henry George; Scott, Robert; A Greek–English Lexicon at the Perseus Project. ^ Ὤγενος in Liddell and Scott. ^ Robert S. P. Beekes: Etymological Dictionary of Greek. Brill, 2009, p. xxxv. ^ Traced back to Adalbert Kuhn, ὠκεανός, in: Zeitschrift für vergleichende Sprachforschung auf dem Gebiet des Deutschen, Griechischen und Lateinischen, vol. 9 (1860), 240, who had refined an earlier suggestion by Theodor Benfey. At around the same time, the Swiss linguist Adolphe Pictet had published quite the same discovery in his Les origines indo-européennes, ou les Aryas primitifs. Essai de paléontologie linguistique. Paris 1859, Band 1, S. 116. ^ a b Michael Janda: Die Musik nach dem Chaos. Der Schöpfungsmythos der europäischen Vorzeit. Institut für Sprachwissenschaft der Universität Innsbruck, Innsbruck 2010, p. 57 ff. ^ a b London 1971.11–1.1 (Vase) at the Perseus Digital Library. See the whole object in several photos on the site of the British Museum. Cfr. also the entry on Theoi Greek Mythology. ^ Homer. Iliad, 14.200 ff., 14.245 ff. & 301 ff. ^ a b Livio Catullo Stecchini. "Ancient Cosmology". www.metrum.org. Retrieved 2017-03-30. ^ Homer. Odyssey, 11.639 ff. ^ Homer. Iliad, 14.301 ff. ^ Homer. Iliad, 7.421 ff., 8.485, 18.239 ff & Odyssey, 19.433 ff. ^ Homer. Iliad, 18.607 ff. ^ The late classical poet Nonnus mentioned "the Limnai [Lakes], liquid daughters of Oceanus" (Nonnus. Dionysiaca, 6.352). ^ Histories II, 21 ff. ^ De situ orbis I, 19. ^ Orbis Descriptio V, 165. ^ Mullerus in Cl. Ptolemaei Geographia, ed. Didot, p. 235. Karl Kerenyi. The Gods of the Greeks. Thames and Hudson, 1951.